New Delhi: With much ardour and gusto, Future Institute hosting “Tracing Narratives”, a month long exhibition at Indian Habitat Centre, New Delhi. 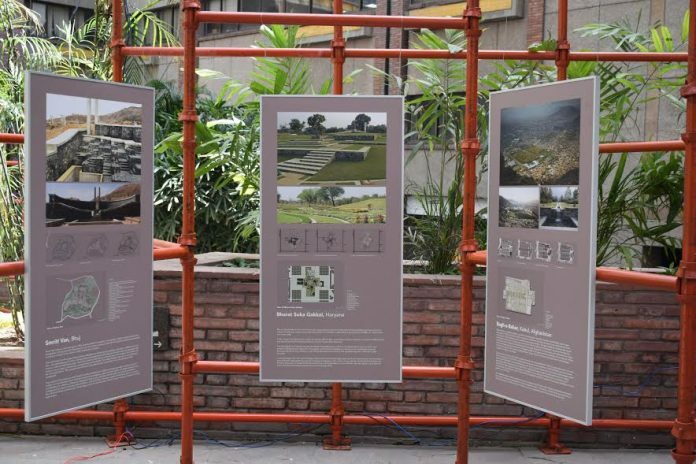 Tracing Narratives exhibition is an attempt to create a lens through which the spectators evaluated the world of landscape designs and its many connotations in the present and near future. It is an initiative of Landscape Environment Advancement Foundation (LEAF) Ahmedabad. LEAF is engaged in research and publication in the area of landscape design and environmental planning. It supports research programs of varying durations every year. Dr. Alka Pande, Consultant Arts Advisor and Curator of the Visual Arts Gallery at IHC inaugurated this magnanimous event. Amongst the buzz around the works on display, the event progressed with the insightful words and excerpts by Mr. Aniket Bhagwat, a third generation landscape architect from Ahmedabad. With a process based and intensive research approach to landscape designing Mr. Aniket Bhagwat threw light on the event and the works on display. Works by widely acclaimed and appreciated sculptors Mukul Goyal & Nimesh Pilla has been put on display. The evening concluded with a stellar music performance by the Chaar Yaar group. The coming weeks involve an enthralling program on the 12thApril titled, ‘in conversation with Architect Pradeep Sachdeva’, a world renowned architect and an urbanist. His approach to landscape designing is that of an urban nature lover. The event also hosts a sketching workshop by Landscape Architect Madhup Mazumder and an informative talk by Mr.Vijay Dhasmana , a renowned naturalist who is passionate about wildlife and wilderness, sharing his experience of rejuvenating Aravali Biodiversity Park in Gurugram, on the 19thApril. Future Institute is hosting the Delhi Stop of Tracing Narratives, at IHC (India Habitat Centre) from March 25th to April 24th 2017. This one of its kind exhibition will be going to 13 different cities across India and has covered Pune, Kolhapur and Surat so far. The exhibition will be moving to Mumbai and will be showcased in May 2017.